You will need to select either the MTX2 for 434Mhz transmission (supplied with an RG174 tail to make an antenna) or the suitable APRS module for your region (or both Habduino can do simultanious transmission on both radios). Selected radio modules will be assembled and tested. To track the location of flight you also need a radio receiver, aerial and PC on the ground. Suitable radios include SDR dongles/Airspy - see http://ukhas.org.uk/guides:sdr_tracker for examples of suitable models and full instructions. Ublox MAX M8Q GPS suitable for high altitude use. Radio telemetry with GPS and sensor data using UKHAS format. Supplied as github repository with instructions. Also Follow @habduinoProject on Twitter for more information. Please note you may need to download the libraries.zip and extract them to arduino/libraries for the compile to work. Antenna : Customer to weigh. Arduino : Customer to weigh. SMA male attached to a 30cms piece of RG174 coax cable. 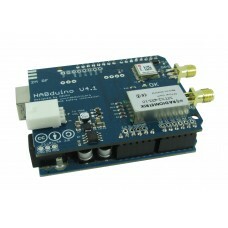 Suitable for making 1/4 wave antennas f.. Frequency Range: 144/434MHz (2M/70cm) Impedance: 50Ω Gain 2.15dB Max Power: 10 Watts V.S..
SMA male to SMA male double straight pigtail RG316 suitable for linking your PCB to your an..